Oh boy. Friday-Eve is upon us and it's now less than a week until Christmas! Are you ready? Today's card is inspired by this wonderful inspiration pic that came courtesy of Cath Edvalson on Moxie Fab World. Check out the original post of this picture here. I turned this die cut bird into a robin by colouring him all over with a brown alcohol marker, adding detail with a dark brown marker, and colouring his breast red. To add a little more to this robin, I then covered his red breast with red Stickles. The fact I coloured it red underneath makes gives him a deeper red breast. See the branches? They're made from twine. Tiny dots of Glossy Accents and a bit of manipulation with the twine makes a great branch with texture. Keeping it super short and sweet today. Still have plenty to do and not enough time to do it in! Eeek! What a little cutie bird Aimes! Just darling! Love your sparkly snow bank too! I love how you created the branches with the twine. All around beautiful Aimes! This is so sweet! I love the sparkle! 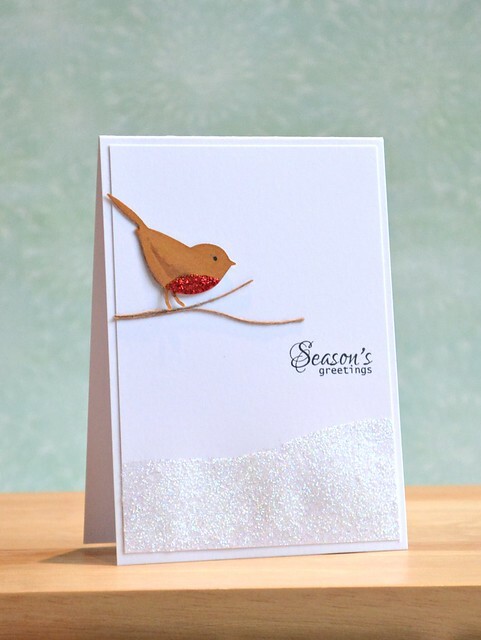 Love the sparkly red breast on your cute bird and the layer of glistening snow! now how sweet...love the smidge of red glitter on her belly & the twine branches? genius.